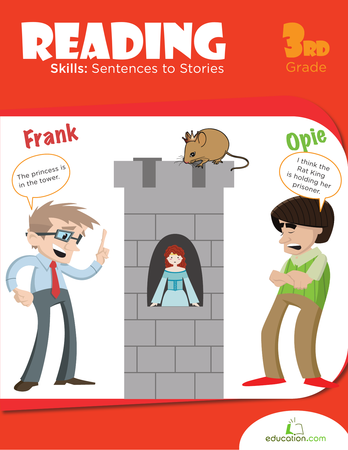 The reading and writing practice in this workbook will get kids thinking about all the different parts that go into a good story, like vocabulary, structure and sequencing. Use this resource with your students to practice writing concise fiction summaries. Searching for a worksheet to help with your kid's reading skills? This printable uses a classic Aesop Fable. 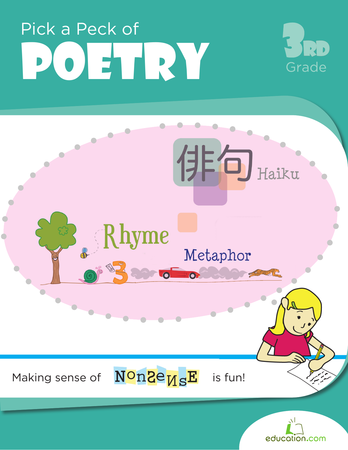 Help your child learn to navigate narrative poetry, then write his own poem, in this super-fun narrative poetry worksheet. Folktales are a great way to get your child into reading, and to help them consider moral values as well! 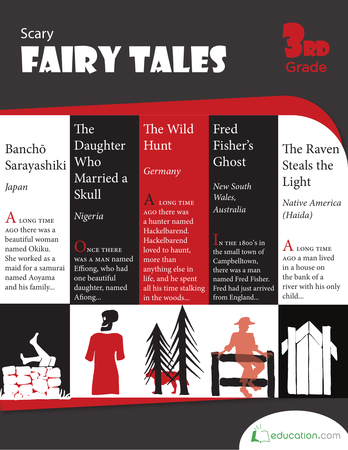 In this reading worksheet, students can compare two ghost stories from other sides of the globe and see the ways in which they're eerily similar. Is it real or is it fantasy? This lesson introduces students to the literary concepts of realism and fantasy. Readers will practice this skill by using details in texts to distinguish the two genre elements. Kids match reading genres to descriptions in this worksheet. Use this camping-themed Reader’s Theater Script to engage your students as they practice reading fluently. Then challenge them with reading comprehension questions about the characters and events. Kids hunt for different reading genres using this interactive worksheet. 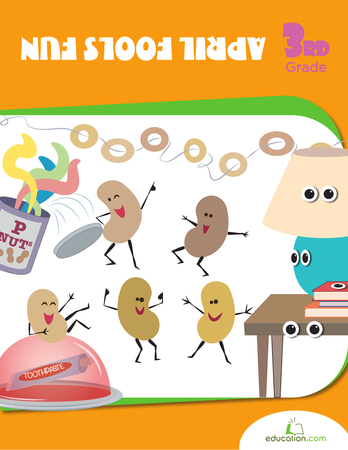 Using figurative language is a great way to boost your child's writing skills and creativity. With the help of this worksheet, she'll be a metaphor master. Sorting it Out: Real or Fantasy? With this worksheet, students will practice determining if the sentences fit under the category of fantasy or realism. What's a metaphor? How do you haiku? Kids will hone reading and writing skills with this book, from a simple syllable counting exercise to inventing rhymes and tangling with the Jabberwocky! 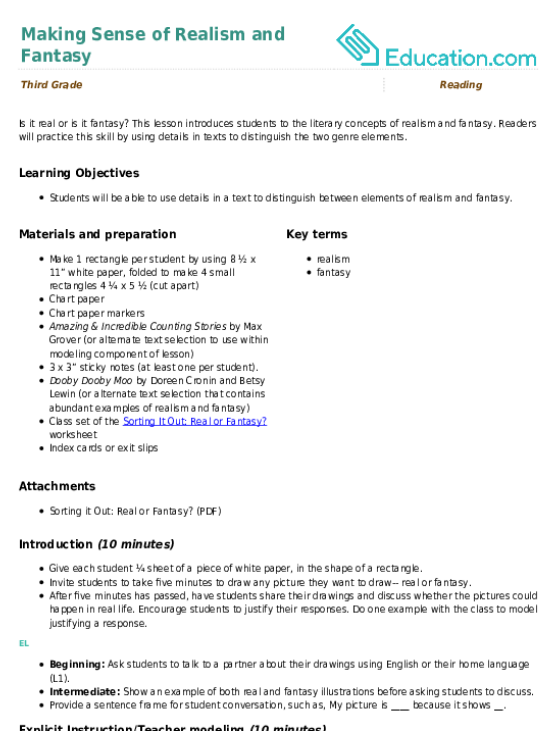 Use this handy story map to help students organize the events and lessons in the fables and folktales they read. 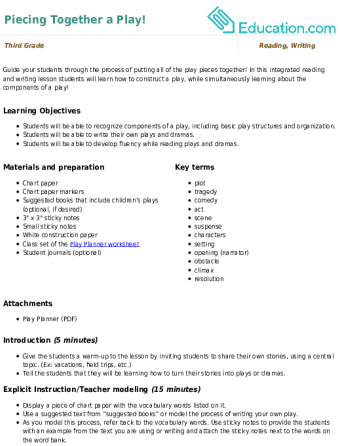 This graphic organizer will help your students reflect on important story elements in their fantasy texts, as well as focus on the key details of their stories. What better time to learn how to rhyme? Try this worksheet; it'll be sweet! Your child can learn rhyme scheme using this famous Robert Frost poem. Guide your students through the process of putting all of the play pieces together! In this integrated reading and writing lesson students will learn how to construct a play, while simultaneously learning about the components of a play! Did you know that Reader's Theater promotes fluency and builds students' reading confidence? Use this lesson to inspire your students to practice reading and understanding text in the drama genre. This old Native American myth, The Raven Steals the Light, is the perfect story to spook -- but not scare -- kids this Halloween. Use this lesson to help your ELs learn about the differences between realism and fantasy. This lesson can stand alone or be used as a pre-lesson for the *Making Sense of Realism and Fantasy* lesson. 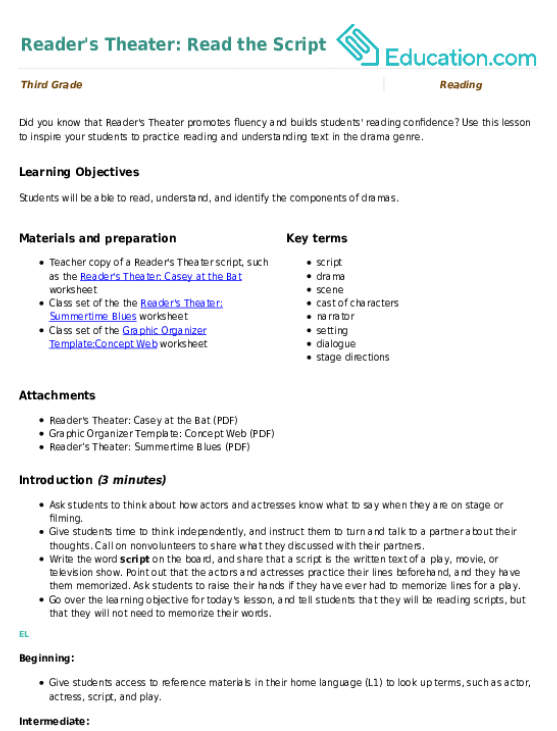 Use this winter-themed Reader’s Theater script to engage your readers as they practice reading fluently. Then challenge them with reading comprehension questions about the characters and events. Practice reading comprehension with a wide variety of world tales, some famous and some little-known. The book shines a light on supernatural stories, monstrous myths, and terrifying true-life tales. Get familiar with some types of poetry in this worksheet that covers different poetry structures. Here's an arsenal of April Fools' Day fodder! Kids will be armed with facts, pranks and puzzles. Plus, they'll be tickled by goofy writing prompts, silly word problems and wacky reading comprehension. 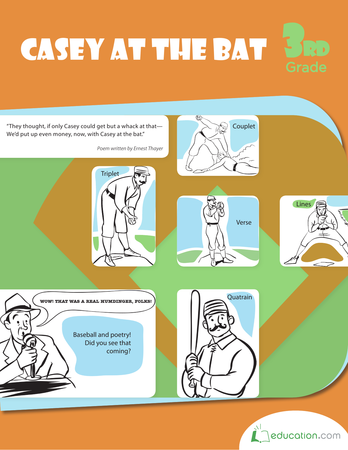 Practice reading, writing, and understanding poetry with the help of the Mudville Nine by exploring the classic poem, "Casey at the Bat."